Astrophysicists finally have an explanation for the violent mood swings of some of the biggest, brightest and rarest stars in the universe. The stars, called luminous blue variables, periodically erupt in dazzling outbursts nicknamed “stellar geysers.” These powerful eruptions launch entire planets’ worth of material into space in a matter of days. The cause of this instability, however, has remained a mystery for decades. Now, new 3-D simulations by a team of astrophysicists suggest that turbulent motion in the outer layers of a massive star creates dense clumps of stellar material. These clumps catch the star’s intense light like a solar sail, erupting material into space. After jettisoning enough mass, the star calms down until its outer layers re-form and the cycle begins anew, the astrophysicists report online September 26 in Nature. Identifying the cause of the stellar geysers is significant because every extremely massive star probably spends part of its life as a luminous blue variable, says study co-author Matteo Cantiello, an associate research scientist at the Center for Computational Astrophysics at the Flatiron Institute in New York City. Luminous blue variables, or LBVs, are exceedingly rare, with only around a dozen spotted in and around the Milky Way galaxy. The gargantuan stars can exceed 100 times the mass of the sun and approach the theoretical limit of how massive stars can get. LBVs are also exceptionally radiant: The brightest ones shine with more than 1 million times the luminosity of the sun. That light pushes matter spaceward because absorption and re-emission of a photon by an atom results in a net outward shove. The tug of war between extreme gravity pulling material in and extreme luminosity pushing it out is responsible for the trademark outbursts of LBVs, scientists believe. The absorption of a photon by an atom, however, requires that electrons be bound in orbits around the atom’s nucleus. In the deepest, hottest layers of a star, matter behaves as a plasma with electrons untethered from atoms. In the cooler outer layers, electrons begin rejoining their atoms and can therefore absorb photons again. Previously proposed explanations for the outbursts predicted that elements such as helium in the outer layers could absorb enough photons to overcome gravity and fly into space as an outburst. But simple, one-dimensional calculations didn’t back up this hypothesis: The outer layers didn’t seem sufficiently dense to catch enough light to overpower gravity. Those simple calculations, however, didn’t capture the full picture of the complex dynamics within a colossal star. Cantiello, along with Yan-Fei Jiang of the Kavli Institute for Theoretical Physics at the University of California, Santa Barbara, and colleagues took a more realistic approach. 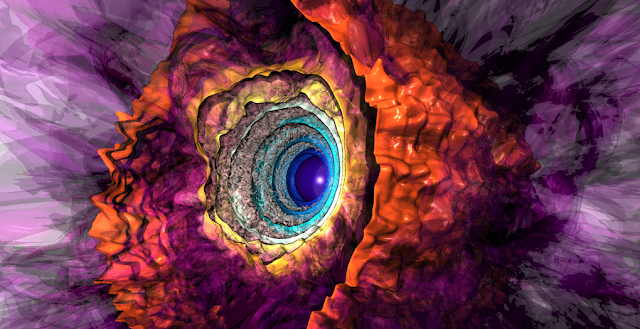 The researchers created a detailed, three-dimensional computer simulation of how matter, heat and light flow and interact within supersize stars. The calculations involved required more than 60 million computer processor hours to solve. In the simulation, the average density of the outer layers was too low for material to go flying — just as the one-dimensional calculations predicted. However, the new calculations revealed that convection and mixing in the outer layers resulted in some regions being denser than others, with some clumps opaque enough to be launched into space by the star’s light. Such eruptions occur over timescales ranging from days to weeks as the star churns and its brightness fluctuates. The team estimates that such stars can shed around 10 billion trillion metric tons of material each year, roughly double the Earth’s mass. Improving the fidelity of star simulations is crucial to achieving astrophysical insights, Cantiello says. The move from simple, single-dimensional calculations to full 3-D simulations requires more computational muscle and more complex physics, but the results are well worth the trouble. “We had to implement all of these physics to see, with our own eyes, that this process — that we didn’t expect to be important — would turn out to be key to understanding these violent eruptions and the evolution of these massive stars,” he says. Cantiello and Jiang coauthored the paper with Lars Bildsten and Omer Blaes of the University of California, Santa Barbara, Eliot Quataert of the University of California, Berkeley, and James Stone of Princeton University.